P & D Equipment Company has been providing sales and service of car wash overhead doors for the last 15 years. We have been able to sell top quality equipment in all of the New England and Eastern New York areas. P & D Equipment Company is dedicated to researching and providing the highest quality products available to our clients. We are long time distributors for AIRLIFT car wash doors and RE VERBER RAY radiant heaters. From start to finish, customer satisfaction is our driving factor. We deliver the product you except to receive. P & D Equipment Company will continue to build our respectable reputation by letting our products and services speak for themselves. P & D Equipment Company offers premier products and services for a reasonable price. More over we are very flexible and work with our clients to find them the most suitable solutions to meet their needs. P & D Equipment Company offers special discount pricing for first time customers. You will also find that we are more flexible in our pricing and service costs than most car wash companies. Please feel free to contact us by phone, email, or our Contact page. 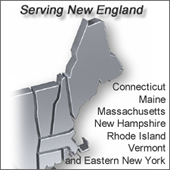 P & D Equipment Company services New England including Connecticut, Maine, Massachusetts, New Hampshire, Rhode Island, Vermont or Eastern New York from our offices in Bellingham, MA.